amap : A tool to analyze .MAP files produced by 32/64-bit Visual Studio compiler and report the amount of memory being used by data and code. This app can also read and analyze MAP files produced by the GCC, Xbox360, Wii, PS3 (gcc and SNC), and PS4 compilers. In case of the -f option amap will create five new files (with extensions .all, .module, .file, .subsection, and .section) next to a map file. Map files created with WinAVR toolchain are malformed. Their sub-sections are not sorted by address. Because of this amap will show negative code size in some cases. x64 v0.30 linked against GTK. x64 v0.30 linked against X11. x64 v0.29 linked against GTK. x64 v0.29 linked against X11. x64 v0.28 linked against GTK. x64 v0.28 linked against X11. x64 v0.25 linked against GTK. x64 v0.25 linked against X11. x64 v0.18 linked against GTK. x64 v0.18 linked against X11. x64 v0.16 linked against GTK. x64 v0.16 linked against X11. x64 v0.10 linked against GTK. x64 v0.10 linked against X11. x86 v0.18 linked against GTK. x86 v0.18 linked against X11. Other versions - install Wine and run a Windows version. Uploaded 0.30 build for MacOS X. Improved parsing of Cortex-M map-files. Improved parsing of GCC map-files. Added new tab "Memory Configuration". It is disabled by default. It can be enabled in "Options --> Show Memory Configuration" menu for GCC-based map-files. Improved export of data into files. Improved parsing of GCC 5.2 ARM map-files. 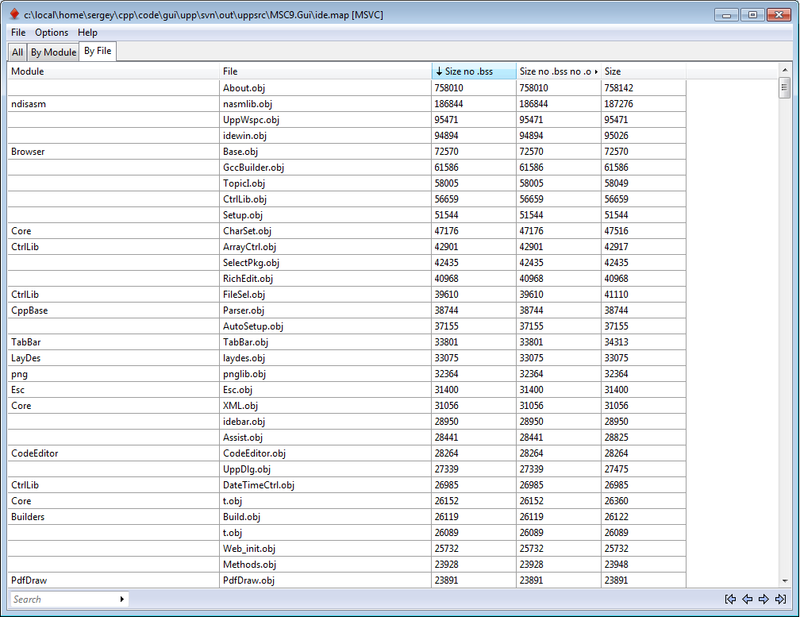 Improved parsing of ARM-Cortex-M map-files. Cortex-M compiler often produces malformed map file. Fixed parsing of ARM-Cortex-M map-files. Fixed parsing of module/file name. Fixed exporting of parsed data. Improved parsing of Microchip v1.40 map-files. Improved look and feel with UHD displays. Changed algorithm of detecting of SubSections in GCC map files. It is still not perfect but works better with ARM-related map files. 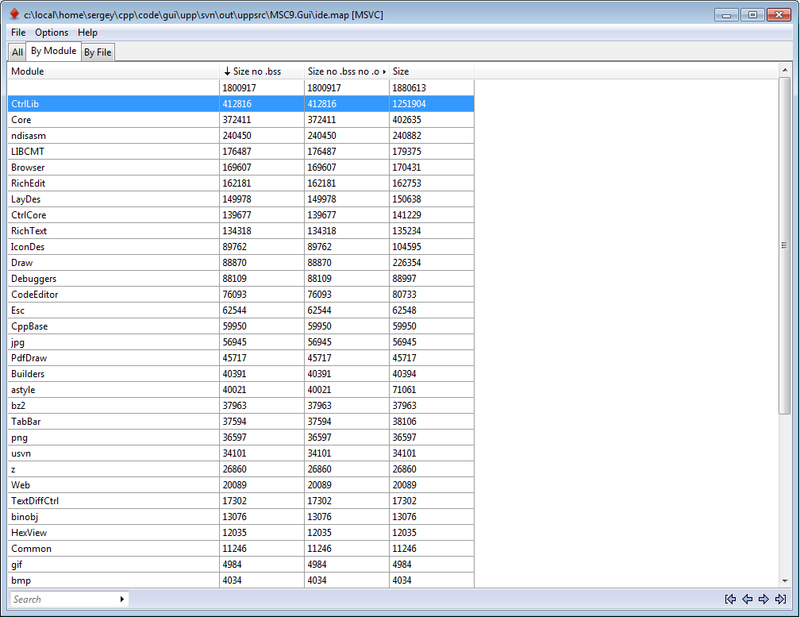 Added parsing of Microchip map-files. Improved parsing of CodeWarrior map-files. Current Windows 32-bit version is still compiled with MSVC. I still have problems compiling with 32-bit MINGW. 64-bit version for Windows is compiled with MINGW and capable of demangling of GCC symbol names. Current version is compiled with MSVC. GCC-based version is not available yet. Improved parsing of GCC for ARM map files. Parse section and sub-section names. Improved parsing of GCC map files. There is still a knonw issue with parsing of map files compiled for ARM. In this case all symbols are marked as belonging to .text sub-section.